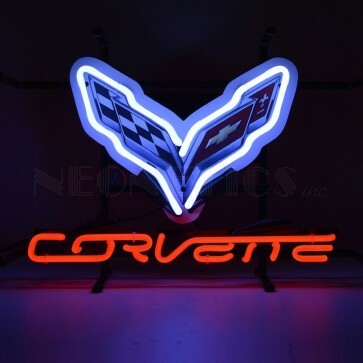 This C7 Corvette Neon Sign features a warm mesmerizing glow with multi-colored hand blown white neon tubing surrounding a full-color C7 crossed flags background and red neon Corvette signature underneath.The entire sign is supported by a black finished metal grid. It's powered by industrial strength transformers, which operate silently and more efficiently than incandescent bulbs. You can hang it against a wall or window; or you can sit it on a shelf. No assembly or special wiring required. All you have to do is find the perfect spot, plug it in, and turn it on. Measures 17"W x 12"H x 6"D. For indoor use only. Due to size, this item is not eligible for Free Shipping. $18.95 Flat Rate shipping will be added at checkout. Available to shipping locations in the Continental USA only. Crossed Flags Steel Sign | 12" x 7"